Tonight the Art with Heart team are sharing creative projects featuring the colour pink. 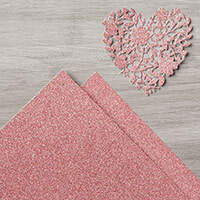 We hope our blog hop inspires you to get creative with the various shades of pink that Stampin’ Up! offer in our collection of 53 different colours available. I selected the In Color Powder Pink to feature in my project today. Love this pretty soft pink. I've used the First Frost bundle for the stamping and framelit using Powder Pink and Smoky Slate inks. I borrowed the leaf from Rooted In Nature too - stamped in Soft Sea Foam. The leaves there are cut from a scrap of the Frosted Floral DSP - loving that paper. The base card is shimmery white and I've used the Petal Pair embossing folder on the edge. How handy are the adhesive backed sequins. 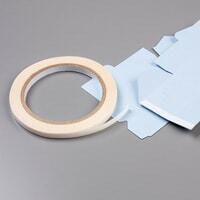 I usually run a mile from anything fiddly but with the adhesive backs these are just too easy. The basic pack has some nice soft colours including Petal Pink which I've added to this project. Now it’s time to hop on over to our next participant, the very talented, Rebeccas Jacovou for some more pink themed projects. Thanks for hopping along with us this month. Here's a variation on the colours. This time I've used Crumb Cake in place of the Gray Granite. I was inspired by this card from our catalogue. I love the vintage photo effect of this next sample - might have to give that one a go next. Isn't it pretty. This could be yours free with a $270 order this month, plus you'll get $27 in coupons to redeem in September. If you're ordering online don't forget to claim your Stampin' Rewards products before you check out. Once you reach $250 in products ordered you'll qualify for rewards. Just choose the products you're after and click the 'claim rewards' button to get them for free using your rewards. Isn't this just beautiful paper. I can't get enough of it. Just lovely photo realistic designs on one side with beautiful flowers, and some soft patterns on the other side. Just add a little greeting and let the paper do all the work. 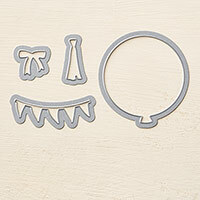 Framelit is from Stitched Shapes - a very versatile framelit set to have in the collection. Here's one of the other designs - with a sponged edge to soften the white edges. 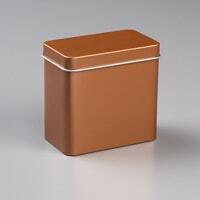 Have you seen the cute little copper tins we have? You get 4 tins in a set (shopping link below.) They're perfect to pop a gift card in nestled on some tissue paper, or to make a set of 3" x 3" cards and package them up in the tin. Here I've dressed one up with a wrap of Petal Promenade DSP and a copper sticker on the lid. Tear and Tape is a good adhesive for this - nice and strong. Last couple of days of our DSP Buy 3, Get 1 Free special if you're keen to stock up on some of your favourite papers before July ends. 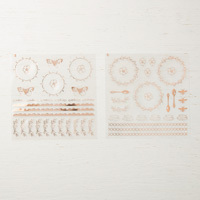 This must be just the most gorgeous thinlit - the Detailed Floral Thinlit with coordinating Floral Phrases stamp set. I just LOVE the projects on page 76 and 77 of the catalogue featuring this bundle. I took inspiration from the samples to make these cards. Tips and Techniques: I've layered the Night Of Navy cardstock over shimmery white cardstock for this one. The white craft ink showed nicely on the darker cardstock. Embossing would give it even more oomph I think. Some pearls to finish. My current favourite plate for cutting these detailed thinlits is the new Big Shot Platform. It is ever so slightly raised in the middle section and I find I'm getting really even nice cuts using it with the acrylic pads. I run it through and back, then turn it 90 degrees (1/4 turn) and run it through and back again. The die brush is handy for getting lots of the little bits out. The precision plate is good too for the detailed thinlits - although it is very rough on the acrylic plates and tends to warp them so I save all my old hacked up ones for use with my precision plate. If I had to choose between the two - I'd invest in the new Big Shot Platform. For this one I stamped the greeting straight on and of course managed to get it a little wonky - so stamped it again on a strip of cardstock and popped it up on dimensionals. That did the trick - mistake all gone. I roughed up the edge with the side of some scissors for a little added texture. I do love the 3 sizes of pearls all lined up. I'm busy here today making another mess in the dining room. This time I'm tackling a job I've been meaning to do for AGES. I've got a heap of half completed post bound albums here and I'm taking all the completed pages out and transferring them to big ring bound albums. So instead of having a bunch of albums that say "Hannah 2004" with 6 layouts, and "Hannah 2007" with 3 layouts - I'm just going to whack all the finished Hannah layouts into a ring binder (or two) in rough chronological order. Two full albums instead of 10 itsy bitsy ones. The process is taking me rather longer than planned as I can't help reading all the stories as I'm going. So having a rather delightful trip down memory lane as I jiggle and juggle and sort. I did notice one thing as I was making piles. The Hannah pile is about 3 inches high and the Jack pile is rather short!! Seems like I was in a huge scrapbooking phase when Hannah was a toddler and not so much during the Jack years. So 'scrapbooking about Jack' is on my next to do list I think! Some more balloon card inspiration for you today. This one is a variation on Saturday's card. Tips and Techniques: To make this one just grab a pack of your favourite Designer Series Paper. 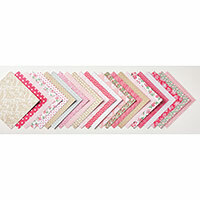 I've used the Love Blossoms DSP Stack on page 17 of the Occasions catalogue. (Note: There's a typo in the description - this is actually a pad of 6" x 6" squares, not 12" x 12".) You get 48 sheets with coordinating designs. Makes it so easy to grab some that work well together. Punch, arrange - all done. You could whip up a bunch of these in a short time. I was on a bit of a sparkly phase that day so added some coordinating Blushing Bride glimmer paper too. Every day is better with a bit of glitter I think. Got anyone who could use some sparkle in the mail? 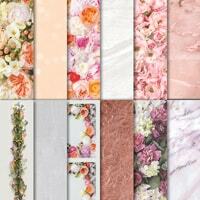 Add a pack of glimmer paper to your next order. My favourite colour in the glimmer paper is our beautiful Dazzling Diamonds. Such a nice shade that goes with anything. Another Hexagon Hive thinlit card today for you. This time I've used one of the designs from the Retro Fresh DSP (patterned paper) and topped it with a Whisper White layer. Some pretty flowers and pearls to finish, popped up on some of our handy Stampin' Dimensionals. 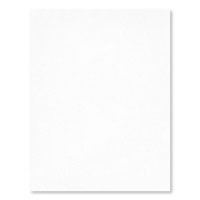 12 sheets - double sided. 12" x 12"
Find it here if you're shopping online. There are some great coordinating products in this range. Save 15% when you purchase them together. 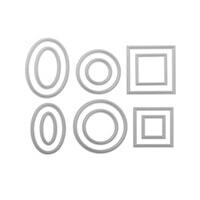 6 stamps that coordinate with punches for quick and easy greetings. These ones are very popular with my class ladies. Stamp set here along with the list of coordinating punches. Hexagon Hive Thinlit Tips: To stick the hexagon layer to the card I like to use snail adhesive on the back of the larger hexagons then a dab of Tombow glue on some of the thinner bits. I hope you get some creative time this week. Got any projects on the go? I've hunted out a bunch of photos of my siblings and I and am halfway through a little album using the Mini Memories Simply Created Album Kit. I've got 2 sisters and a brother and it has been fun looking through the photos from when we were kids. Looking forward to seeing how the album turns out. We had a play with the Hearts A Flutter bundle last month at class. I've used a few of the different framelits in this card, and the coordinating stamp set too for the heart. The base is Crumb Cake, then a layer of the Primrose Petals core'dinations cardstock embossed and sanded. I sponged the elements with black ink to grunge them up a bit and help them coordinate together. The heart and that scallop circle are snipped from the More Amore Specialty DSP. The heart is stamped on vellum and embossed with the dotty folder. .... and I whipped up a super quick scrapbook layout of my little guy. Pop back tomorrow afternoon if you'd like to see that. A recap of our soon to be leaving colours - Regal Rose, Pretty In Pink, Bashful Blue, Certainly Celery, Baja Breeze, Riding Hood Red, Bravo Burgundy, Not Quite Navy, More Mustard and River Rock. Colour Refresh update is here. Some of the ink refills have sold out already. I know River Rock, Bashful Blue and Certainly Celery refills are gone. Be quick if you're after products in these colours. I'm out all day and evening tomorrow at a family funeral, so online ordering might be the best bet if you're keen to get an order in super quick. To place an online order visit my demo site here: Sue's Demonstrator Website and click on the Shop Now button. I'll be back on deck Thursday if you'd prefer to phone or email as usual. Hello and I hope you're having a lovely weekend. Today's card features the Pop Up Posies Designer Kit. The kit (on page 18 of the Stampin' Up Seasonal Catalogue) has 9 of those handy tags, plus all the bits and bobs you need to embellish them with 3 styles of flower. There are 9 fabric covered brads plus the flowers - some as pictured above in Calypso Coral and Pool Party, plus some Very Vanilla patty pan style ones. You get some bakers twine as well as that Just For You stamp. Pop the completed tags on a gift, or use them on a card like I have. The kit including the stamp is $22.95. I've used a Crumb Cake base and piece of patterned paper from the More Amore DSP pack on page 10. I had some lace leftover from the Artisan Embellishment kit too. Speaking of Amore - Valentines' Day was last month and it was my turn to remember (well only just!) John and I seem to take it year about. I remembered rather late so was in my usual rush. I got a little cake from the bakery, a card out of my stash from a Stampin' Up event a few years ago, and quickly punched a couple of hearts from the More Amore DSP to pop onto a toothpick and stick into the cake. Punches are such handy tools! Here's a closer look at the card. The stamp set has long retired (I've forgotten the name of it now) but I thought I'd share the idea to use acetate. Sort of hard to photograph but the base card is acetate or window sheet, then there's the cardstock panel stuck onto the front and inside ready to write on. A bit of a fingerprint collector but nice for something different. And now I'd best get back to the dining table. I'm chained to it this weekend filing a gazillion bits of paper while we have a weekend catching up on some tax returns. And filling up a few boxes of recycling along the way. It will be nice to get it all done I guess. Hope your weekend includes something exciting. Happy stamping. Back again with another card I made while playing with the Artisan Embellishment Kit. All of the things on this card are from the kit, except the base which is Primrose Petals and the strip and circle of patterned paper which are from the More Amore DSP. I thought the cards that the kit ribbons are wrapped around looked too nice to discard, so trimmed some off one, rounded the corner again and popped it on to my card. You can find the Artisan Embellishment Kit and the More Amore DSP on page 10 of the new seasonal catalogue. * Drop me a line if you'd like me to post you a free copy of the new catalogue. * Choose a free saleabration item with every $100 purchase until March 22nd. 19 to choose from. * February and March class dates and details are up on the class page and filling very fast. Get in touch to grab a spot. Details here. * Join my team. Starter kit is only $169. Choose $294 of products. Click the link below to join right now and your kit could be on its way in no time. Or click here for some more details about becoming a demonstrator. One of the things that jumped from the new seasonal catalogue straight onto my wishlist was the Artisan Embellishment Kit on page 10. Lacy and layered is not really my comfort zone but I've thoroughly enjoyed having a play with this kit and trying out a different style. Isn't the lace lovely. My base is brushed bronze (retired), and then I've got a Pool Party layer with a nice embossed edge. The heart is from the laser cut sheets of hearts in the More Amore DSP pack (pg 10). They come in two colours. I love the assortment of resin buttons in the Artisan kit. I've used glue dots to attach them here. The butterfly punch is the new little one on page 13. I can't resist a new punch! I'll be back tomorrow to show you another card I made with the kit. It has been fun to experiment with something different. Reminds me of when I got my wedding dress. Mum and I had a lovely day out browsing wedding dress shops and I'd tried on a stack. At this particular shop the assistant was putting my selections into the change room and said - let's just try this one too. It was quite a different style to the ones I'd been looking at and I didn't like it at all on the hanger. I put it on and fell in love with it instantly. That's really got nothing to do with cards has it!? Must have lace on the brain. Happy stamping and thanks for stopping by. 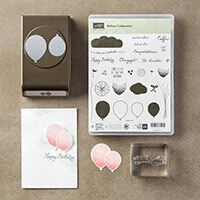 Love Stampin' Up products? We'd love to welcome you to my Think Ink Team. Would you like $294 of quality craft supplies for $169? Join my team today and your starter kit could be on its way before you know it. Choose any current products. Valid until March 22nd.